As we get ready for the true start of the 2017 outdoor track season, we’re going to dedicate some time this week to examining the U.S. track and field record book, and see what marks could fall. We saw a slew of American and world records lowered indoors, but how will that translate to the outdoor season? Will the good (read: fast) times continue to roll? (Keep in mind that some of the records that fell indoors were records at off-distances or in events that were contested until recently.) Will fitness gains be made ahead of an outdoor season with World Champs berths on the line? We’d like to think so; and we’re calling out which records we foresee being made obsolete. We’ll also share our thoughts on some of the records that we don’t think are in reach for some current U.S. athletes – mainly in the women’s short sprints. It’s the year following the Olympics. But 2013 showed us that fast times could still follow an Olympic year, ahead of an IAAF World Championships. We’re seeing many American greats at the apex of their abilities, as well as a new generation of upstarts lighting a youthful fire beneath their asses and this changing-of-the-guard scenario is especially true in the handful of events we’ll focus on. As always, if there’s an event or athlete you’d like the Citius Mag brain trust to harp on in particular, shoot us an email at [email protected] or tweet. And if not, sit back, relax, and enjoy some American Record-focused speculation! This year’s U.S. Outdoor Championships will be held in Sacramento from June 23 to 25. Worlds will be held in London from August 4 to 13. 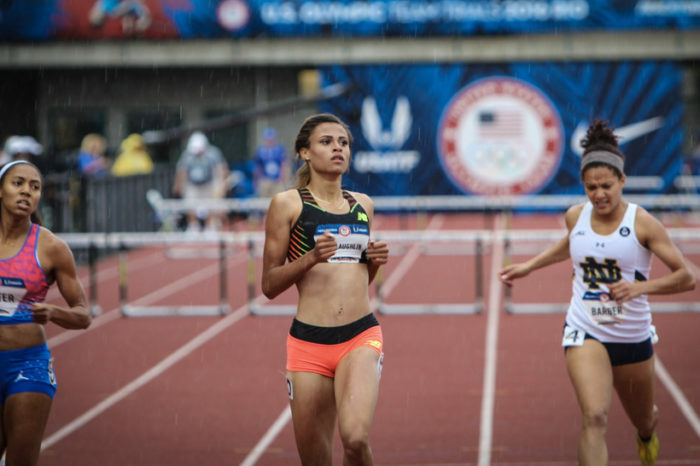 The 400m hurdle American Record seems poised to fall, but who breaks it? Will Molly Huddle lower her own American Record in the 10,000m this year?